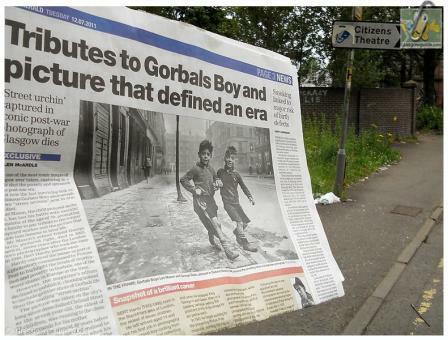 The last surviving link to the iconic Gorbals Boys photograph has died. Glasgow grandfather Les Mason, the child pictured on the left of the famous photo, has passed away at the age of 70. Mr Mason became famous later in life after his family discovered that he was the boy carrying the shopping bag in the photograph taken with his pal George Davis in 1948. 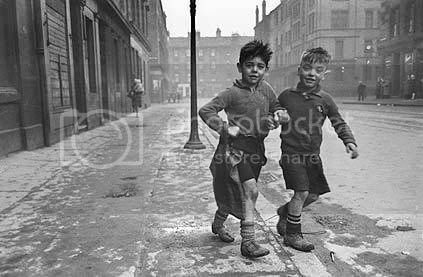 The two Gorbals boys, depicted as 'street urchins', were walking across a Gorbals' street arm-in-arm on the way to the shop to get messages for Mr Mason's mum. The picture was taken in 1948 by the late photojournalist Bert Hardy, who had been despatched from London to tkae phographs highlighting poverty in the Gorbals, which at that time was one of the most deprived and overcroweded urban areas in Europe. Picture Post, the magazine for which Mr Hardy warked, did not subsequently print the photo as a part of the story on poverty in Glasgow, preferring more austere depictions of the grimness of life in post-war Gorbals. Despite this, the photographer always insisted that the now-famous Gorbals Boys shot was the favourite of his career. "It was 1985 and another newspaper ran a retrospective looking back at Bert Hardy’s work which included the Gorbals Boys photograph and an appeal to trace the two boys featured in it. The search was then picked up by the Evening Times in a ‘where are they now?’ article. I think it was George Davis’s wife who saw it first and when mum saw it she recognised the story and asked dad: ‘Is that you?’ My brother Scott was a teenager then and he looked a bit like dad did in the photo. It was nice because we didn’t have any other photographs of dad as a boy." Mr Mason's family added that the former shipyard worker had been very proud of his link with Glasgow's past. George Davis, the other child in the photo, died in 2002, aged 61, seven years after the London-born photographer who took the photo. "We were only about eight years old, and must have been going down Clelland Street to collect our entitlement of cod liver oil, orange juice and dried milk from the Ministry of Health store." "I was one of 13 children, although only eight of us made it past infancy. We were all crammed together in a one-room flat infested with rats, sharing an outside toilet with the rest of the tenement. But everyone lived that way. We didn't know we were poor until other people told us." Aww, that's sad. RIP. What a great picture that is though. My DIL is going to the Funeral. She is friends with his Daughter..
An iconic Photo , sad loss. I read this story today and thought it would be one for the GG site to be aware of. I read that the two boys met later after eagle eyed relatives spotted them in the paper. It is an absolute cracker of a photo, I understand that it has world reknown but at the time it wasnt considered suitable. Yeah Very sad End Of An Era I was only one when we moved out but returned most weekends to visit my gran 1st @71 Cally road then In Cumberland St Facing St Francis Chapel . Why 'Gorbal Boys'? I have no idea what Clelland St looked like back then but the one in the photo looks far too short to be Clelland Street, which is (now) only 190 feet long. It look more like Glassford Street (facing north). So what were two eight year Gorbals kids doing there on their own? How does this photograph highlight poverty? OK, it's not Little Lord Fauntleroy, but I used to dress like that in 1950s Coatbridge and we weren't considered poor. I have seen this foty many times but never took the time to get the whole story about the two young boys, I have always loved this snap. If a picture paints a thousand words this has to be one of them. Thanks so much for the foty and the info about the boys , its a treasure indeed. Superb put down there. Luv it. As you say you've no idea but what a barge in. Eight year olds out on their own. What year were you allowed out out on your own? Did your maw not send you for messages or did she prefer a more sensible sibling? And by the way The Picture Post did not print it as it did not show poverty in their eyes. The picture for me does sum up a way of life which was prevalent in all working class areas of Glasgow in the period after the war and the 50s. As someone born in the early 50s I can remember the areas quite well.Where I lived in Cowcaddens and Queens Cross was on a par for the amount of squalid tenements people were forced to live in.Thankfully these places have been replaced and Glasgow has transformed into the great city it is today. I dont think the picture is in Glassford Street in the 50s.Had it been so there would be overhead trolleybus power lines. The two men are gone but the wee boys are with us for ever. I very much remember what the Gorbals area was like, in 1945-46 I used to deliver the Glasgow Citizen newspapers in a van of course, to the newspaper shops around that area including Govan, that picture definately depicts the poverty of that era, but there was always a smile on the childrens faces, as they were not aware of their predicament. If I remember rightly, I think when they demolished the Gorbals, didn't most of the residents relocate to Barlanark, which I believe was between Shettleston & Bailieston, going towards my birthplace of Coatbridge. Thank you for that touching story. That could be a picture of me and my brother living in Govan in the forties and fifties. We didn't know we were poor either. It was quite safe in that era for kids to wander about quite freely and we often went for messages to the local shops. Such a shame that no-one involved in this pic is around anymore, may they all R.I.P. It's such an iconic photograph as these were supposedly poverty stricken children who had that gallus look about them with big smiles on their coupons in the face of grim lives at the time, but they were children who didn't know what poverty was. To me, it's a defining photograph of a changing world; optimistic about the future and hoping for the best. Amazing Glasgow photo. RIP Les and George. Exactly , that could be anyone in that photo and reading the history theres just no way it can be proved one way or another.